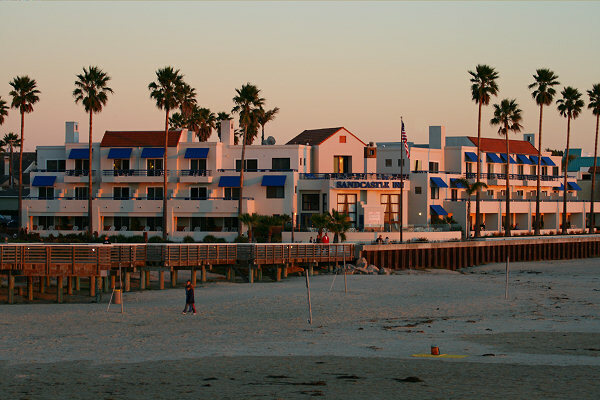 An excellent dog-friendly hotel is The Sandcastle Inn in Pismo Beach. The three biggest things this hotel has going for it are location, location, location. The Sandcastle Inn sits right on world-famous Pismo Beach, and is directly adjacent to the Pismo Pier and the Pismo tourist district. There are many restaurants and gift shops within walking distance. If you would like to walk (or jog) on miles and miles of beautiful beach, or try your hand at surfing… this is the place for you. Most of the other pet-friendly hotels in the area are either up on the cliffs overlooking the beach, or inland next to the freeway. The Sandcastle is right on the beach. This is the place I would stay if I needed a hotel and was traveling with my dog. There are many shops and restaurants and tourist attractions within an easy walk of the Sandcastle Inn. You can definitely have a good time here, without ever using your car between the time you arrive and the time you leave. 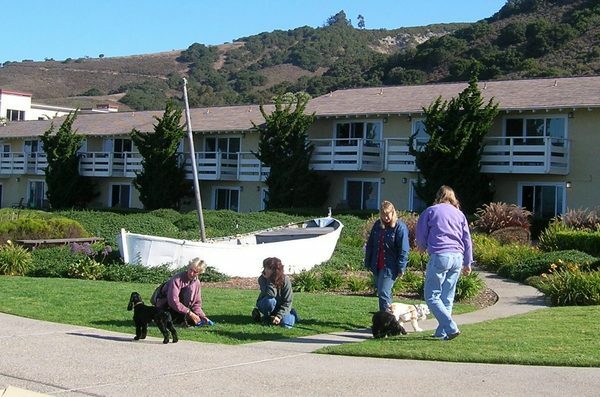 Whenever we have one of our Pupapalooza parties, most of our out-of-town guests stay at The Spyglass Inn, located in Shell Beach. It's an older hotel, but it's in fairly good shape. We use it for Pupapalooza because they have a large number of rooms where pets are allowed. You don't really have beach access at The Spyglass Inn, because it's up on a bluff overlooking the beach rather than being down at beach level. Great views, though... and there's a restaurant next door and a nice little deli across the street. There's a swimming pool, too. If you're looking for luxury, try The Cliffs Resort. This is one of the fanciest hotels in San Luis Obispo county... they even have valet parking! Pets are allowed in the rooms that are on the ground floor. The grounds are beautiful, and so are the views. There's a really nice pool that was recently renovated, and there's even a trail down to a small beach and some tidepools. 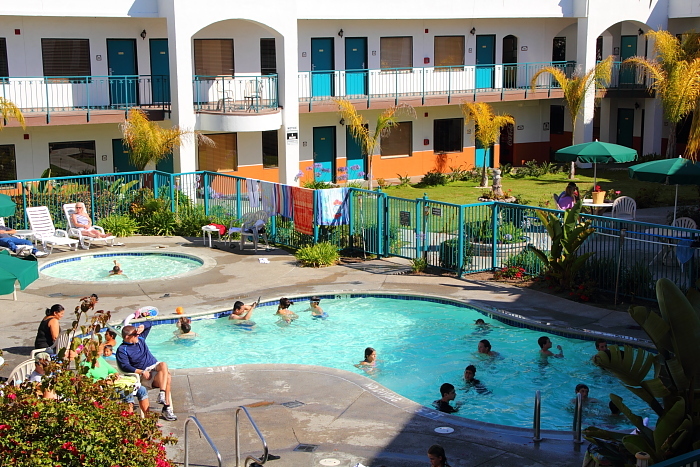 If you'd like a larger room than you can get in a normal hotel, try Oxford Suites - Pismo Beach. 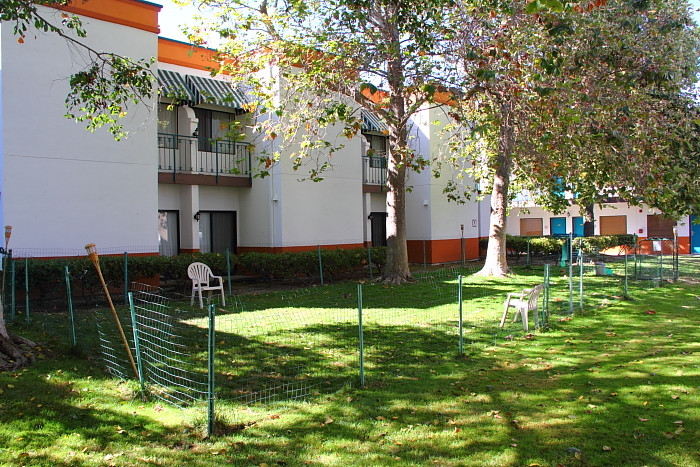 One great pet-friendly feature of this hotel is that they have a fenced off pet area on one of their lawns... so you can take your dog for a little play time right there on the hotel grounds. While the address is in Pismo Beach, this hotel is in the city of Pismo Beach, not at the beach itself. By getting away from the expensive ocean-front real estate, they can keep their room rates down... and there's very easy freeway access, too, as it is right next to highway 101. They also serve a really nice breakfast in their dining room each morning, and it's free. Not a continental breakfast... a REAL breakfast! Another nice place is The Cottage Inn. 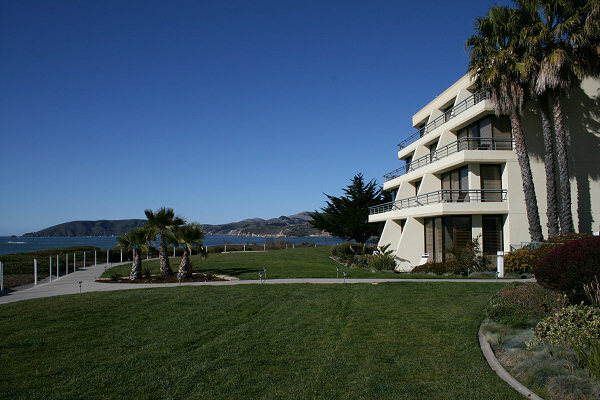 This is another hotel up on the bluffs overlooking Pismo Beach. The rooms are nice, and the hotel is only a few years old. It doesn't really have any big advantage over any of the other hotels... but it's a good one to keep in mind if all the others are booked up. If you're on a tight budget, the place to stay is Motel 6 in Pismo Beach. It's located right next to a Denny's restaurant, so it's easy to get a nice breakfast in the morning. There's even a swimming pool. Of course, at these prices you're next to the freeway and not at the beach itself... but you'll definitely save money here compared to the nice hotels right at the water's edge. Looking for a good meal in our area? Check out a few of my favorite restaurants!